Sandro Botticelli is another one of those Florentines who we know by his nickname (it means little barrell). His given name was Alessandro di Mariano Filipepi. He was a student of Fra Filipo Lippi, who you may remember as the naughty monk (father of the painter Filipino Lippi, see December 13th). 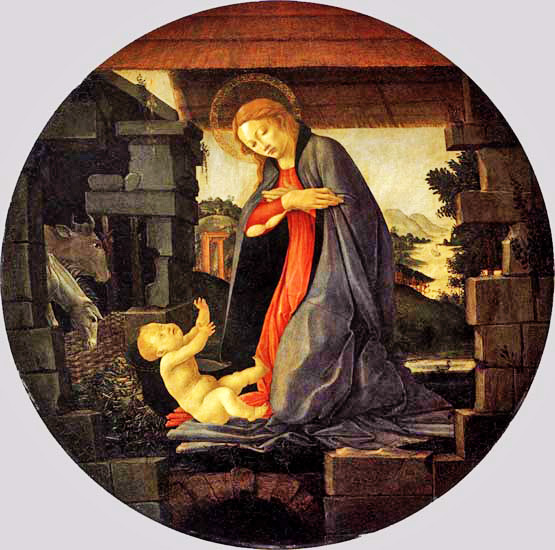 Botticelli’s painting is a tondo (a term for a round painting or other image). This was an increasingly popular shape for depictions of the holy family in the late fifteenth century. The broken building is symbolic of the sinful pagan world, into which Christ is born to redeem humanity. It was a common feature in such paintings throughout Europe. The scene doesn’t come straight from the Bible, but from meditations on the relationship between the Virgin and Christ. Mary understands the importance of her son, and keeps everything she knows about him close to her heart. As with most paintings of the Virgin and Child, this one is as much about Mary as it is about Jesus, showing her as a graceful and virtuous paragon. Clicky for a (slightly) bigger image!